This independence Day floral designers are giving red, white and blue blooms a boost with fresh herbs. The herbs add surprising texture and fragrance to this arrangement of asters, salvia and zinnias. Plus the touch of yellow from the fennel adds a modern twist to the classic patriotic palette. 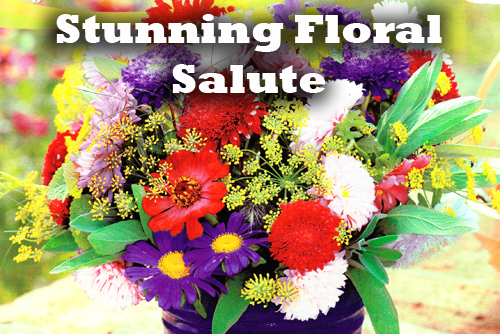 Cut 24 garden flowers, 8 each of red, white and blue to 10" in height. Hold one red, one white and one blue stem in your hand, twirling the bunch as you add the remaining flowers once at a time, alternating colors. Set the bouquet into a water filled high glossy blue garden vase or planter. Let the stems fall naturally and then start filling in the gaps with fennel and sage. The spiky buds of the fennel and fuzzy soft leaves of the sage not only add color, texture but a delightful fragrance that is lovely. Garden blooms often have soft stems that will droop in the vase over time and during summers heat. If your container's bouquet starts to look faint, simply slip three skewers into the heart of the arrangement, angling them to create a tepee in the center. This triangle framework provides a makeshipf trellis that will prop up the leaning flowers.